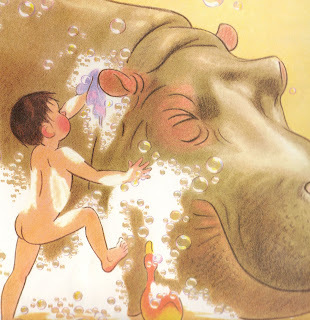 Vintage Kids' Books My Kid Loves: There's a Hippo in My Bath! Any suggestions on where I can find this book? I guess I should google it and see if it's still in print. It looks great, and I share the Illustrator's name (a plus :) ). there are some on amazon, but they start as $35... i know I've seen one for sale as low as $19.... just keep your eyes open... i'm still looking but as of yet been too cheap to splurge, so I just keeping getting it from the library. Gosh, this is a great one. What marvelous taste you have! It's really such a *relief* to see these older books get attention...thanks for all you do to keep them alive.